When choosing a root canal dentist there are many to choose from in Tempe. At Tempe Family Dental we have the best team to make your root canal comfortable and predictable. There are over 14 million root canals completed every year. It’s a very successful and simple procedure that can save your natural teeth and will help prevent more expensive and time consuming implants or bridges. In the middle of your tooth is a the pulp. The pulp is a collection of nerves and blood supply that help build the surrounding tooth. 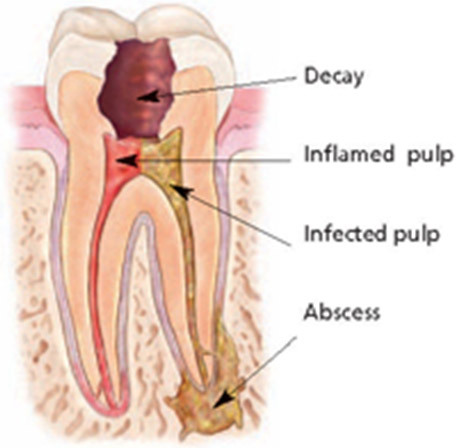 Infections or abscesses can be caused by deep decay, cracks, trauma or repeated dental procedures. Symptoms of infections or abscesses can be discovered as swelling of the tooth, sensitivity to temperature or spontaneous pain the the tooth and gums. On the left you can see that anatomy of an infected tooth. This image is a slice into the middle of the tooth. Painless root canals can happen and at Tempe Family Dental we can help you be comfortable during this procedure. We use local anesthesia to eliminate pain and also nitrous oxide to help sedate you during treatment. What is the success rate of root canals? The success rate of root canals varies and depends on the tooth and experience of the provider. In general 90% of root canals are successful over 5 years. We guarantee that if we finish the root canal that it will last you 5 years as long as proper oral hygiene and regular check ups are maintained. 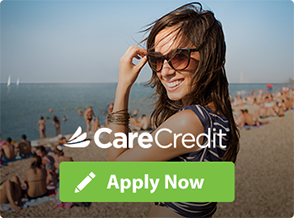 With our experience comes years of experience of examining and treating teeth. We have the newest technology to help diagnose teeth. Majority of patients feel relief after treatment and have only minor pain/discomfort. For the most part your jaw and gums will be a little sore. For this pain we recommend 600 mg ibuprofen every 6 hours, this should take care of any discomfort/pain from the root canal. In a few cases you can get an endodontic flare up. This is when the body overreacts to the disruption of the access. For these cases some prescription strength pain medications are needed to help get some rest. After the root canal is completed a filling or crown is needed to help prevent further decay or fracture of the teeth. Below is an image showing the progression of treatment. When you come into see us we will walk you through the decision and benefits vs risks of each procedure.